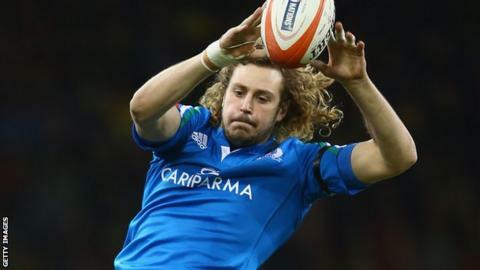 Newcastle Falcons have signed Italy international lock Josh Furno from French Top 14 side Biarritz. The 24 year-old, who was born in Australia, has won 18 caps and in this year's Six Nations. Furno began his career with Viadana, before moving to Aironi, Narbonne and then onto Biarritz last summer. "Josh is a fantastic signing, who is a great all-rounder," said Falcons director of rugby Dean Richards. "He has international experience from his time in the Italian set-up and has performed at the highest level in domestic competition, both of which will be vital for us in the Aviva Premiership." Furno is the latest addition to the Newcastle squad for the 2014-15 campaign after joined last week. "Having competed against the very best in the Top 14 and the Rabo Direct Pro12, I am now excited to be given the opportunity to challenge myself in the Aviva Premiership," Furno said. "I will be working hard to ensure that I play my part in what promises to be an exciting future for the club."